Since he was a small child, Tom Sieverts has been surrounded by wood. The fact that his home is by the North Sea did not stop this from being the case. His father’s company manufactured garden furniture from teak. High-quality and durable outdoor furniture is just as much in demand in Hamburg as in the rest of Germany. However, says the now 35-year-old, more and more environmentally conscious people – especially his family – are finding it unacceptable that the rainforest is being over-exploited for this furniture. “At first, we were the first to have wood sustainably grown in Indonesia on FSC-certified plantations”, explains Tom Sieverts. His vision for the future, however, was a different one: “tropical wood made in Germany”. In 2008, this became a reality with the founding of timura Holzmanufaktur. Since 2009 the business has been located in Rottleberode in the south of the Harz Mountains in the Eastern German federal state of Saxony-Anhalt. This is only logical: ash, oak, spruce and poplar – the best indigenous types of wood – can here be found on one’s doorstep. Not only that: “This site in the middle of Germany was also our first choice from a logistical standpoint”, says Tom Sieverts. He has been the Managing Director of timura since its founding. What professional connection does he have to the wood industry? He has to laugh. “No direct connection. I am a businessman like my father.” The young company owner’s metier is wholesaling and foreign trading. So he knows how to sell his “tropical wood made in Germany” in a targeted way: through communication and presentation. It is mostly at trade fairs that Sieverts explains to the audience the technology that is used to manufacture timura thermally treated wood. 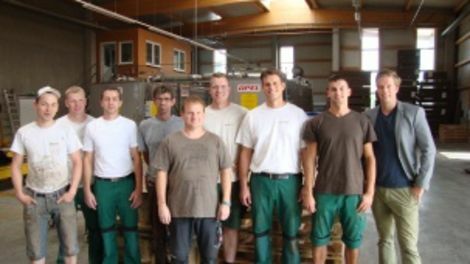 “We searched for a long time for a process with which conventional wood can be processed so that, like tropical wood, it does not absorb any moisture and as a result does not swell, does not crack and is long-lasting”, says Tom Sieverts and that they found a Stuttgart company that had developed a corresponding technology. And which was, on top of that, also looking for a successor! timura Holzmanufaktur GmbH bought up the company and developed its technology further. “Thanks to the thermal enhancement of our indigenous woods we have a genuine alternative to tropical wood”, says Tom Sieverts and explains the so-called Vacu3-process: “The heat transfer between the wood layers takes place in a vacuum chamber by means of hotplates. Due to the additional pressure of 70 tonnes, the wood layers are virtually ironed flat until there is almost no more moisture in the wood. Then the temperature in the chamber is first raised to above 200 degrees Celsius. The colouring of the wood can be controlled through the temperature and duration of the treatment. Vacuum pressure and heat also drives all harmful substances out of the wood.” And there is more. An extremely modern planning plant can process the thermal wood in such a way that it looks as if it has been scrubbed by hand. timura Holzmanufaktur in Rottleberode now has 15 employees. “Tropical wood made in Germany” is part of the company’s name and is in demand as a product even in China and Japan. The untreated wood, on the other hand, which is first processed in the regional sawmills in the South Harz region (Südharz), only has to travel short distances. “My aim is for about 70 percent of the wood to be processed to come from within a radius of 50 to 100 kilometres”, says timura Managing Director Sieverts, indicating the company’s environmentally friendly principles. As one of the local processors of wood, he co-founded the Holzimpulszentrum HIZ in Rottleberode in 2012. This centre promotes the use of hardwood in the construction sector. “We don’t just want to make building contractors enthusiastic about wood from sustainably cultivated local forests as a building material. We get involved in the HIZ’s range of advice and further training for architects, building contractors and specialist dealers”, says Tom Sieverts. Since 2012, timura has been a member of the BioEconomy Cluster Mitteldeuschland. This pursues, among other things, the further processing of wood into an extremely wide variety of bio-based materials with a wide spectrum of very different characteristics. These innovative materials can be the basis for a large number of new products in the bio-economy. timura Holzmanufaktur GmbH fits in well there with its company philosophy: on principle no tropical wood, on principle sustainable, on principle high-quality, on principle individual. Managing Director Sieverts feels that his company is in good hands in a region that supports the bio-economy as one of its leading markets and in which the value creation process of wood plays an important role. With its high-quality environmentally-friendly products, timura is catering for a niche that has potential for global growth.